This two-bed (sleeps 6) apartment is situated in the southern Tyrol, 5 minutes drive from Solden and less than 10 minutes from Obergurgl. This light and spacious accommodation includes a spacious lounge and fully fitted kitchen. 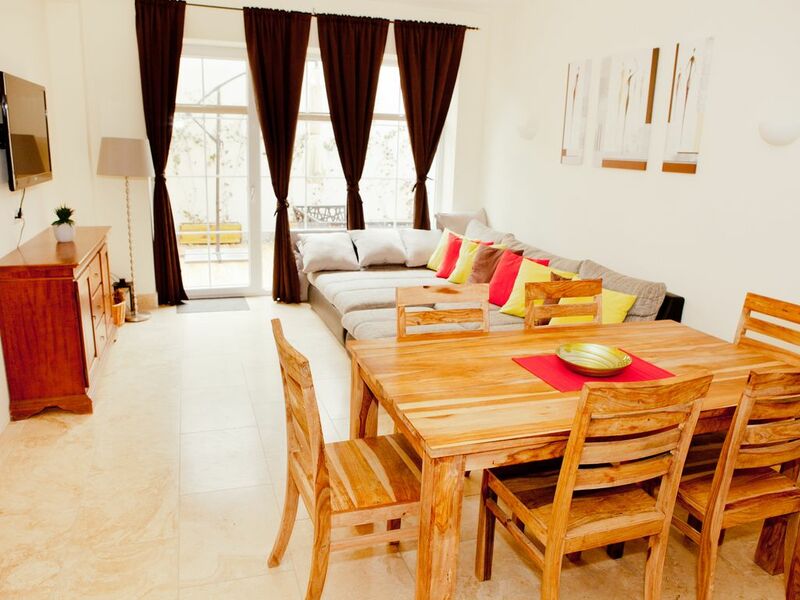 It is situated on the lower ground floor, with access to its private terrace. Solden is one of the highest resorts in Europe, with a long winter season (the first World Cup race takes place there at the end of October), as well as having a flourishing summer season. It has 145km of pistes, served by 33 lifts, and was used as a location in the last Bond film, Spectre! The highest peak is the Wildspitze, at 3,768 m (12,362 ft). Solden is well known for 'BIG3' - the three peaks of over 3000 metres that can be skied in a day. Solden is also renowned for its summer activities - hiking, trekking and biking - and has many marked trails across the mountains. Ever popular with the British, Obergurgl has 110km of pistes and 24 lifts. It also many hiking and biking trails, plus rock climbing and pony trekking. Zwieselstein itself is a picturesque hamlet in the Ötztal valley. It has three restaurants, between a 30-second and 5 minute walk from the apartment. There are plenty more restaurants, bars and cafes in Solden and Obergurgl, and Solden has three good-sized supermarkets. For those driving, the apartment has its own dedicated parking space, and there are car parks close to the main lifts at Solden and Obergurgl. It is a 5-minute drive to Solden and less than 10 minutes to Obergurgl. Regular buses connect Zwieselstein to Solden and Obergurgl. It takes 10-15 minutes to get to Obergurgl. It takes between 5-10 minutes to the main ski lifts in Solden. The bus then continues to other centres along the Ötztal valley. Mother (Erica) and son (Ryan) jointly own the apartment. Erica lives in the UK and likes summer mountain hikes, whereas Ryan lives in Zurich and likes to Ski. The apartment was everything we hoped for! Modern, cosy, well located between two huge ski resorts, a great location for hiking so much to do in the Oetztal valley! There is a shared washing machine and tumble dryer that may be used by guests. There is a chimenea that can be used on the terrace in summer. There is one parking space allocated to the apartment. With the possibility to park a second car in the nearby. The apartment is situated on on the bottom floor, and has its own terrace. There are various staple items in the cupboards which you are free to use, depending on availability. Some satellite channels are avaialble, including UK Sky Sports Main event channel. As well as channels in various other languages. A selection of board games are avaialble at the apartment. A large selection of DVDs are available in the apartment for guest use. Sölden, Obergurgl/Hochgurgl and Vent Ski area all quickly and easily reachable by local ski bus. Geweldige Apartement, foto’s zijn eigenlijk een understatement. Ruim en heel luxe ingericht. Mooie lounge bank! Zomerliften allemaal goed te bereiken, veel wandel mogelijkheden. Ook de gletsjer is binnen bereik! Kortom zeer aan te bevelen, met een uitstekende conciërge! Perfectly located between two of Austria's best and biggest SKi resorts. Both reachable via the local ski bus or car, 3km to the north is Sölden, and 6km to the south is Obergürgl Hochgürgl.